Tankor is a character from the Beast Machines continuity, an era of Transformers that completely passed me by. For this reason, I have essentially no knowledge of the character - no nostalgia for the Beast Era can be found in my bones. However, wanting a new Transformer and finding only this one available, Tankor became a recent purchase. 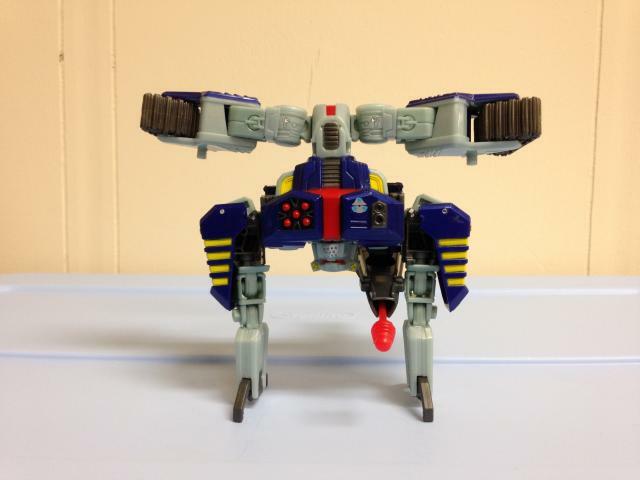 Tankor comes in the Thrilling 30 Generations line, and is designed to closely resemble his animation model from the Beast Machines show. From what I can tell, Tankor hits the mark pretty well. Comparing this version to the original which doesn't even seem close (reviewed here) and the tank drone (reviewed here), this Tankor seems like the best of the bunch as far as accuracy is concerned. Tankor has had some recent appearances in the IDW continuity as well, so my interest was piqued a tiny bit, as I could squash him in with my Classics collection. Did this quirky figure win me over and make me a BW/BM fan? Let's find out! 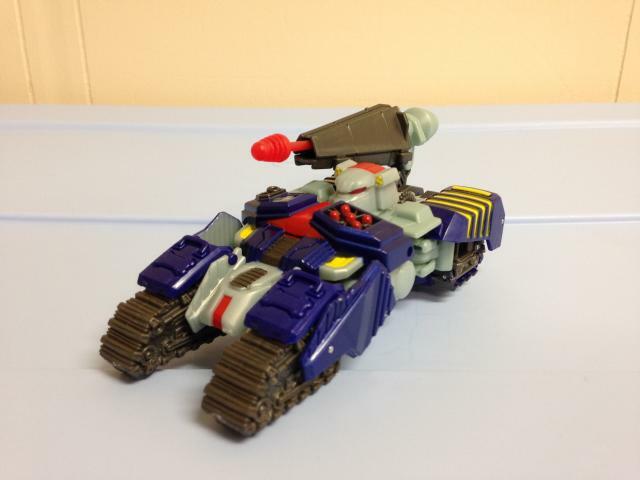 Tankor's alternate mode is a Cybertronian Tank. I think the word "Cybertronian" is defined as: somewhat resembles an Earth vehicle, but really just a mash-up of robot parts to make a similar silhouette. For me, the tank mode has no endearing qualities. 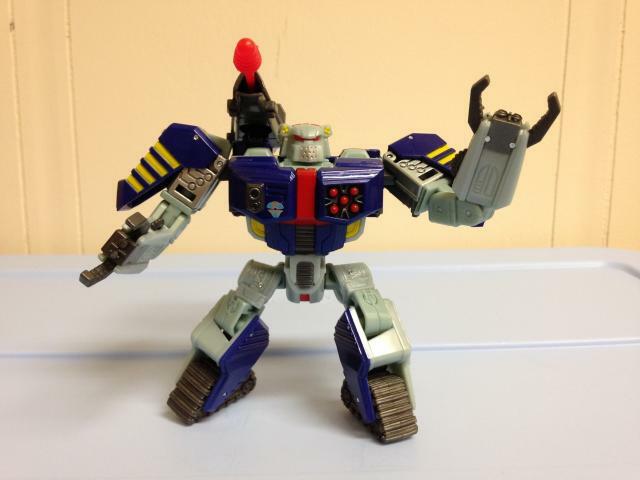 The mode resembles Tankor's animation model, and that's about as good as it gets. Tiny, tiny wheels on the front and a small wheel/roller on the underside are all that Tankor has to make the Tank mode move. It's an incredibly poor design which only rolls on a flat table. The cannon/missile launcher, while also screen accurate and workable, doesn't move or swivel at all. This makes for a very boring tank. The missile shoots well. That's your only positive here. For such a wrecking force, any enemy could just get to his side and attack. Problem solved. Furthermore, the tank cockpit is Tankor's head. I know it's faithful to the original, but that doesn't make it any more acceptable. There is absolutely no reason to put Tankor in this mode. Ever. 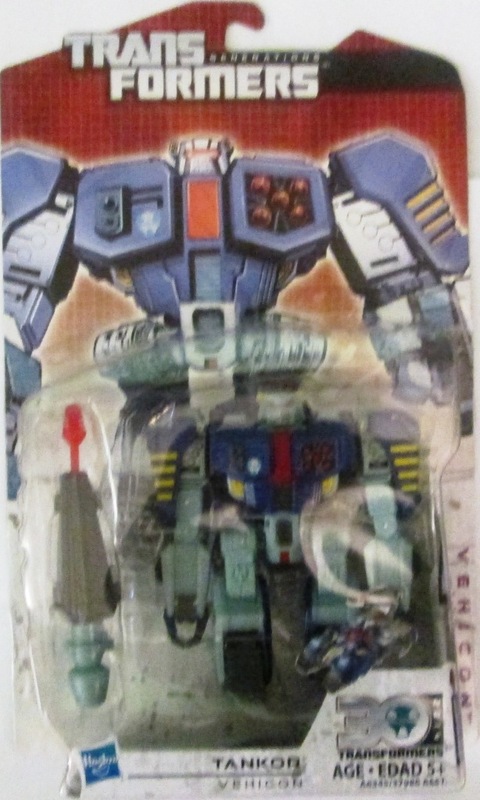 Tankor's transformation basically unfolds from Tank mode into robot mode. That's pretty much as interesting as it gets. Simple, and I suppose effective, but boring. Robot mode is going to be the most fun you'll find in this figure. Tankor is pretty hefty up top, but he's incredibly balanced. That's mostly due to the rather large tread feet, as well as the posability of the arms and the option to swing the cannon onto his back or shoulder, as you prefer. The cannon itself fires via pulling back the large grey outer shell - the missile is of the ball design like Generations Springer's rifle. It works well and shoots quite far, but I find the red aesthetic of the missile kind of goofy. Articulation is top notch for a robot with Tankor's stature. Squatty, bulky, and gorilla-esque, Tankor remarkably has joints upon joints. If I counted correctly, Tankor has 23 points of articulation: neck, 2 in each shoulder, 4 around each elbow, 2 in each hip, 2 for thighs, 2 knees, 2 ankles. This doesn't include the moving claws either - which are geared together to pinch and open both sides simultaneously. The claw feature is great for having Tankor choke other Transformers or carry small bots like mini-cons. The mid-arms/elbows are incredibly well jointed, and essentially any arm position you can imagine can be achieved. The shoulders get a tiny bit hampered on top, but it's nothing major. The legs are well articulated, and Tankor has no problem doing the splits or taking some wide - almost running - stances. 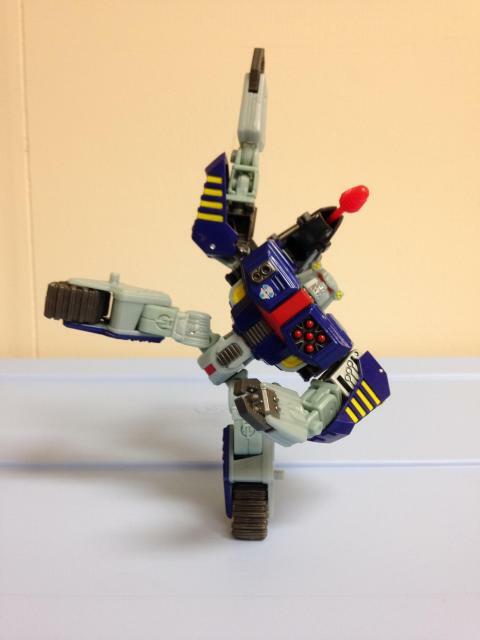 Tankor can do several different action poses, and still remain quite balanced if you tweak everything correctly. Definitely a fine job on the designers' part, and the highlight of the figure, in my opinion. Aesthetically, Tankor's design hits the nail on the head. If you're looking for a screen accurate representation of the character, look no further. Tankor has all of the designs of the animation model, and details are done well. Even though he comes from the Beast Machines era, the design itself could mesh well with a Classics collection, such as his role on my shelf. Overall I think Tankor has a great robot mode and a very passable tank mode. I can't stress enough how well jointed Tankor is, even for a bulky gorilla. Fans of the BW/BM series will enjoy him, and some others will too (myself included); take a chance and you might be surprised. Use caution though, as casual collectors or people looking for a figure with two great modes should look elsewhere. Transformation Design: 3. For a modern toy, this one is quite boring. Tankor basically lays flat and his arms fold up. Not much to see here. Durability: 8. As cheap as the plastic has gotten, Tankor is pretty robust. The cannon arm and claw hands will be the first to go. Fun: 7. For such a chunk, he's surprisingly articulate, bendy, and balanced. The claw hands and missile launcher are good, but the tank mode is a complete pass. Aesthetics: 6. Tankor is a spitting image of his animation model. Robot mode is great. Tank mode, while accurate, is not good for display. Articulation: 9.5. For a fat tank guy, he could be a yoga instructor. The shoulders don't have 100% range, but everything else pretty much does. And he has quadruple jointed elbows! Value/Price: $10 USD seems a little overpriced with the awful alt mode. That's really the point of Transformers, right? Fans of the series and/or character will get more value. Overall: 5. That's not a bad score, that's an average score. For the casual collector, I can't recommend him. Personally I think he's very fun in robot mode with all of the articulation and balance, but tank mode is a bore. Fans of Beast Machines/Wars will find quite a bit to like, and if you're looking for an accurate depiction of Tankor, here's your chance.